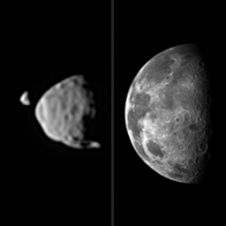 These images of Phobos and Deimos, the moons of Mars, were taken by the Mars Odyssey orbiter’s THEMIS (Thermal Emission Imaging System) camera using visible-wavelength light. The apparent motion of the moon caused by the camera’s point-of-aimaim being moved during the 17-second span of the observation. The distance to Phobos from Odyssey during the observation was about 5,600 km. The Deimos was almost 20,000 km away. The Curiosity rover on Mars used its cameras to take the series of pictures stitched together to make this video. These are the first images from missions on the surface which have caught one moon eclipsing the other. The images were taken on 1 August, but some of the full-resolution frames were not downlinked until more than a week later, in the data-transmission queue behind higher-priority images being used for planning the rover’s drives. The picture on the left shows how big the moons of Mars appear to be, as seen from the surface of Mars, compared to the size that Earth’s moon seen from the surface of Earth.